We are excited to announce the 2019 Ric Nattrass Research Grant has been awarded to Griffith University Ph.D student Thais Sasso Lopes to assist with her research on the recovery of the endangered Fleay's Barred Frog. Stay tuned for the 2020 Grant application opening date. We have launched this new campaign with the release of a great brochure, allowing you to 'be toadally sure' if you have a cane toad or a native frog. Check out the brochure here! NEW frog posters for Greater Brisbane and Bundaberg/Fraser Coast available! Both featuring great photos and handy descriptions, this is one resource you don't want to miss! Pricing can be found here.... Members receive their copy for FREE. 'Log A Frog' Online Mapping Tool Launched! With the assistance of SEQ Catchments, we have developed an online tool allowing our Members to map the locations of frogs they have found which will help to contribute to our knowledge of species presence/absence and population data! If you're a Member, you can check it out and contribute here! Can I keep frogs and tadpoles as pets? 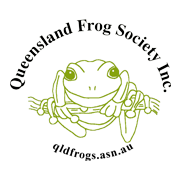 Our aims are to encourage and foster an interest in frogs, to provide expert assistance and education for newcomers and undertake a continuous survey of the local native species to determine their relative abundance and distribution. Support our Aims by becoming a Member!